Hi….I wanted to make sure to tell you upfront that the products mentioned in this post have been received for free for evaluation purposes. With that being said rest assure that I only give honest opinions. The opinions are my own and always will be. Thanks for visiting. Welcome to Barking Wednesday! Each Wednesday I post a interesting topic just for dog owners. Items I have found useful and tips to improve your dog's quality of life. This Wednesday it is all about Quaker Pet Group. Quaker Pet Group is dedicated to all channels of the pet industry. They are committed to delivering the very best in brands, products, and services to retailers worldwide. By focusing on personalized customer care, high quality standards and product diversity within our brands, they hope to make Quaker Pet Group an invaluable resource to independent retailers. One of my friends that is not a dog owner laughs when I pick up Kingers plush toys. She tells me how silly I am...little does she know that plush chew toys are important to the well being of a dog. Check out this very good article about the Importance of Plush Toys. 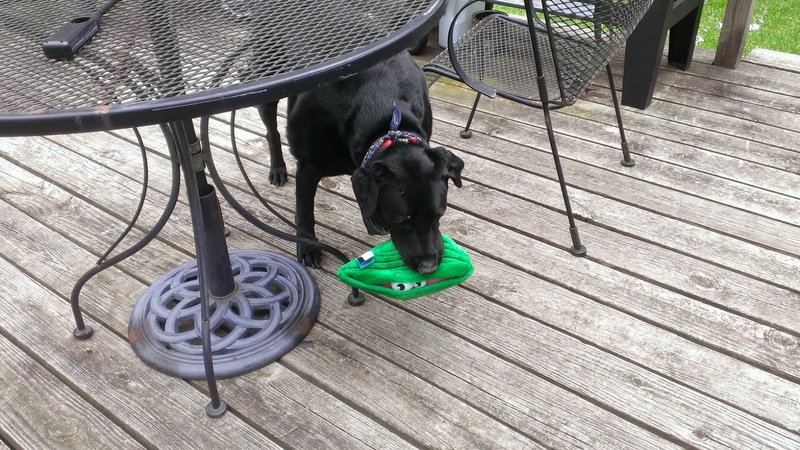 Here is King's newest toy ~ Go Dog Green Claim Shellfish! Oh my it is a cutie! The Shellfish is about 13 inches wide by 8 inches tall. It is a bright green with pink inside and two goofy eyes! Goofy eyes that are saying.."Hey You!" 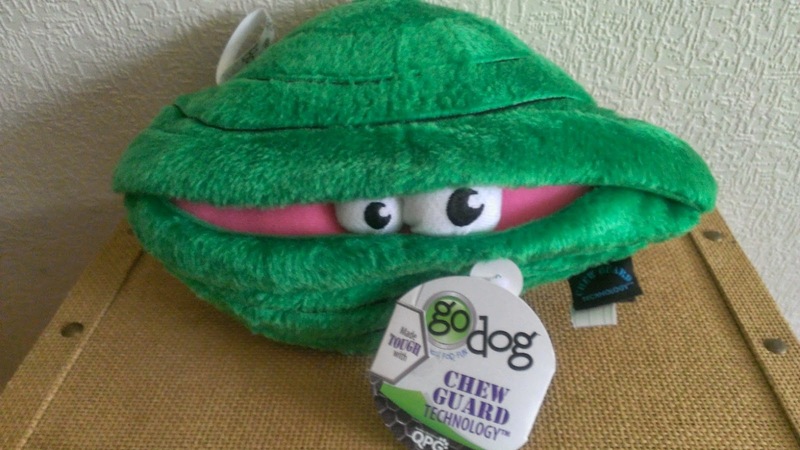 Go Dog Toys are sturdy toys made with Chew Guard Technology™. Chew Guard Technology™ is a manufacturing process that adds a tough durable liner to each toy. 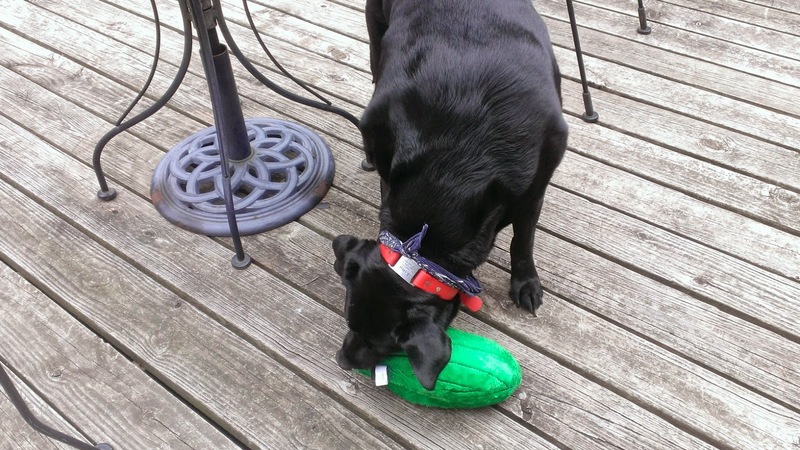 With reinforced seams and the durable liner the toys can withstand the rigors of a dog's play. Kingers is a 100 pound Lab and he can shake the heck out of a toy! There are times when I am amazed at the force he has! Having a plush toy that can take the treatment King gives it is a plus for us. I hate buying him a toy and within 5 minutes I have a room full of toy parts! That never happens with Go Dog Toys. They are made to withstand the rough play that a large dog can give a toy. King is so funny when he gets a new toy...he will not look at me and stays far away from me. NO way is he giving up his new toy! It is HIS!!! I was chasing him around the deck trying to get a pic! I have new neighbors ..... don't you know they are thinking that old lady is crazy! She is talking to that dog and trying to take his picture. Telling that big dog to stop running and look at the camera! Snoozing with his Go Dog! Click Here to check out Quaker Pet Group Products. You can also click on the WHERE TO BUY tab on their website to find a store near you that carries the Quaker Pet Group products. If you are interested in buying quality pet products that are made to last and improve the quality of your pets life..then give Quaker Pet Group products a try! That is the cutest toy I have seen in a long time.My Belinda loves toys she has so many,I remember when she was younger she had a squeaky pink pig she took it everywhere and chewed it to pieces,when we threw it away she was not a happy pup so since then every time she chews one up I have to buy a new one its the only toy she likes even though she has loads lol. Kay - King is the same way - he will chew a toy to pieces and then carry around a piece of it! The Go Dog is so sturdy it is soft but very hard for them to chew up...that is what makes it so nice. No white stuffing all over the living room carpet! My dog, Milo, LOVES plush toys. He has one plush bone that is his all time favorite. That is so adorable, him playing with his toy. I love it. He really is cute playing with it. I love that he loves it so much. What a cute toy. Love seeing your dog playing with it he is too adorable! Haha, That dog toy is awesome! We don't have a dog, but I am going to remember this for a gift for friends who do! Thanks! Cute toy! We don't buy plushies, either because our bulldog destroys them in one day and gets very confused between what is his to chew and my son's plush toys. We opt for Kongs, chews and harder squeak toys. So cute! 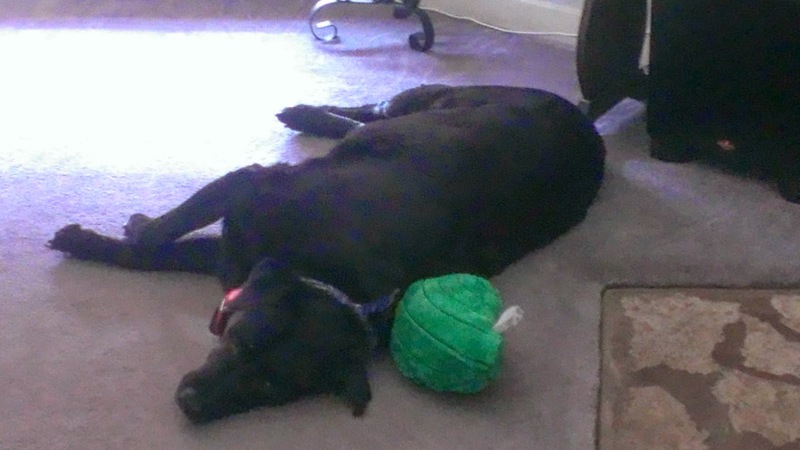 My Newfy would have loved that toy! What a fun dog toy. I don't have dogs, but if I did this would be on my list of wants. I have to dogs and they would love this kind of toy. I'll have to look for it. What a cute toy! I will have to get some for my dogs. My oldest dog is 9 (Casey, boxer) and she doesn't play a whole lot any more. Once in a while she gets going. My little doggie, who is 2 (Tink, Chug - part Pug part Chihuahua) loooooves her toys and her playtime. This is the cutest toy! My kids want a dog really bad and I want to get them one I'm just not ready to clean up after one more living thing in my home. ;) When we do this dog toy will be one of the first things we get. Your dog is adorable. He sure seems to love that toy! I love the shellfish toy! He looks like something my dogs would totally love to play with! Thanks for sharing the pics of your cute pup! My mom's dog can tear through a toy like it's nothing. I wonder if this could survive through Sophie?? What a super cute dog toy! I'll have to share this with my mom, she has a dog, but we don't. LOL that is so adorable! I do not have any pets but I know my kids would like it! I really like the website!! There are some great products on there!! I love my dog and buying him treats and toys makes me and him happy!! LOL Shari - King does the same thing! I need to get my dog some of these toys. She has chewed up or buried every toy she owns! That's smart to add the durable chew liner. I worry about toys getting shred and becoming choking hazards for pets. I have never heard of the Quaker Pet Group products. Thanks for the great review and I will definitely check for these for our dog. I hate buying toys that get torn up in 5 minutes, too! Aw, I miss my dog. It might be time to add a new fur baby to the family soon. So adorable! I'm always looking for new toys for my dog! That is really cute, and the best picture is of him sleeping with his toy! Keeping those toys intact are always a challenge. I haven't heard of this brand, but I will sure let my best friend know as she has a dog, that destroys the toys instantly! Ha! Cute toy. I love the last picture - adorable! I think that proves he likes it! This is a super cute toy! This sounds like a wonderful company! Those look like great dot toys. My German Shepard would love those toys. What a cutie. I miss being a dog owner so much. Those really are some tough toys! That pic of him sleeping next to it is so cute. Cute! We stopped buying my dog toys because she'd tear through them. Wonder if this would hold up for her. My puppy loves plush toys! The clam is so cute. Stella would like that! I have 3 dogs and think all 3 would love this! Never heard of this brand, super cute! 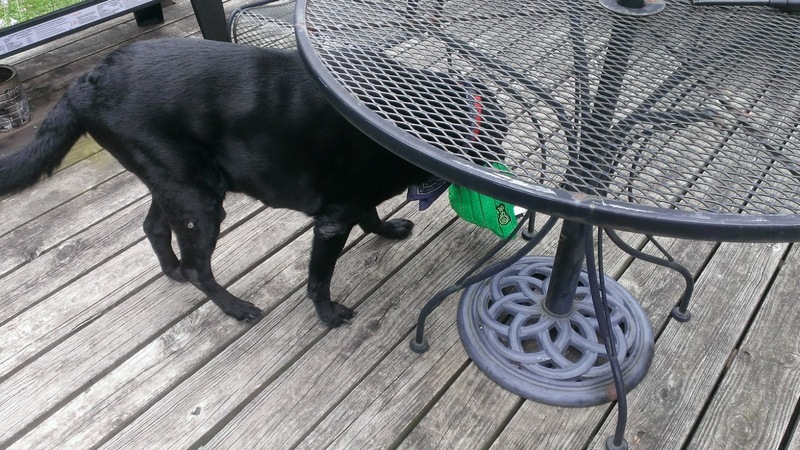 Ugh my lab will not let the tennis ball go. Maybe I need to find him some of these instead! My dogs would love that! Only problem is, they're not that big, but totally DESTROY their toys within a few hours. That is too cute! My puppies would love this one. My kids might try to steal it from them! How fun! They have the cutest toys and accessories for pets nowadays! I love it! Aww he is so cute! I really need something my husky can't destroy, I can't wait to check these out! Good to see a toy that can withstand a big dog, our pup when we had it could destroy any toy we bought him. He is tired out!